Last year I worked with Hide&Seek to make a website for Film4 to support the release of the film Dreams Of A Life. The site launched in December, and it’s called Dreams Of Your Life. I still have problems with describing the site. It’s definitely not a game. It’s not, in itself, a story. And I’m not going to saddle it with the horrible noun “interactive”. Its narrative, written by A.L. Kennedy, takes you through an exploration of “society, friendship, love and loneliness”, in keeping with the theme of the film — a documentary about Joyce Vincent, a 38 year-old woman who was discovered in her bedsit three years after her death. 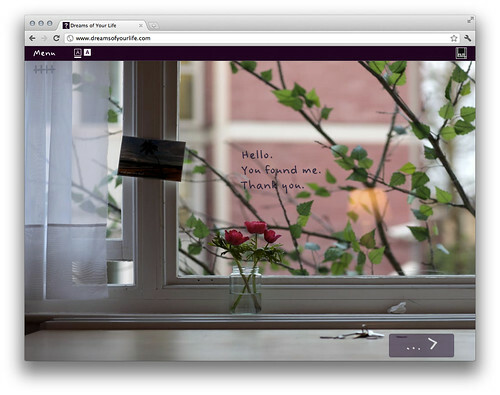 The branching journey is split over many full-window screens, as a conversation, asking the user questions. The background of each screen is a photograph taken by Lottie Davies, a huge series of subtly shifting views of the same scene. It requires a little time to get into, so when you have some spare — ten minutes? 20? 30? — give it a gentle spin. For a website that is so simple in appearance — essentially a single “page” — this was one of the most complicated pieces of front-end coding I’ve done. When the project started we weren’t sure what the final “thing” would be, and I began making a site that would, hopefully, be as flexible as possible. Inevitably, it wasn’t always flexible enough in quite the right places, but it enabled us to construct a site around an experience and narrative that was continually being adjusted and tweaked. Hopefully the final result is an absorbing, image-rich, smooth experience where the technology gets out of the way. Hide&Seek have more about the project.